Happy Easter. I started my Easter weekend with a day off on Friday, but since my internal clock is programmed to wake me up around 6:00 am every day, weekday, weekend, or holiday, I slept in but was still up at 7:00 am on Friday, with the rest of the family still fast asleep. Since Friday is normally a busy day for me, it’s an “off” day for exercise; no running, no weights, no nothing. Expect on Good Friday, since I wasn’t working, and I was awake, I started my day with a nice easy stretching workout, with the television on in the background. And, luckily for me, CNBC was broadcasting live with a special Good Friday morning edition of Squawk Box, in advance of the Jobs Report. It was classic CNBC. Each guest gave their predictions for the number of jobs that would be created. I don’t remember everyone’s exact prediction (because really, who cares? ), but the predictions ranged from 185,000 to 280,000, if my memory serves me correctly. It was really cool watching the real time futures chart on the CNBC screen, as the Dow futures, where were up marginally, started to tank, and finished the holiday shortened session at 9:15 am, down the equivalent of 131 Dow points. Presumably it means that on Monday the markets will open lower, but that may only last for an hour, or a day. Who knows. A closer read of the Employment Situation Summary from the Bureau of Labor Statistics shows that the United States still has many festering problems, and those problems could have a significant impact on the elections this November. For example, the unemployment for adult men is 7.6% and for adult women it’s 7.4%, which are decent numbers. If you are white, the unemployment rate is 7.3%. However, the rates are much higher if you are a teenager (25%), black (14%) or Hispanic (10.3%). That racial divide can’t be healthy. Another worrisome number is the number of long term unemployed, at 5.3 million; that’s 42.5% of all unemployed people. If you’ve been out of work for a week or two, it’s no big deal, but if you are one of the long term unemployed, you’ve been looking for work for 27 weeks or more, and things aren’t looking so rosy for you. In a booming economy there will always be unemployment, but as long as it only lasts for a few weeks it’s not a serious problem. Unfortunately there are over 5 million people who will think this is a very serious problem. I’m not an American, and I don’t get a vote, but it will be interesting to see which candidate can tap into this feeling of ill will. Obviously the Republicans will make the argument that unemployment is as high today as it was when President Obama took office, so it would appear the trillions in government spending has done no good at all. Of course the Democrats will argue that without that spending things would be much worse. All I know for sure is that the Dow was down over 1% in this short week, and will likely fall on Monday. Is the top in? I have no idea, but it’s obvious that the “bull” market that started with the “correction” in December is running out of gas, and the 13,300 level looks like solid resistance. Of course you could also argue that 13,000 looks like solid support, so time will tell whether this is simply a necessary pause in a resumed up-swing, or if in fact the top is in. The Relative Strength Index sits at just under 50, and if it turns upward that’s a good level to resume rising, so we are at a near term inflection point. Of course 13,300 isn’t the important number. 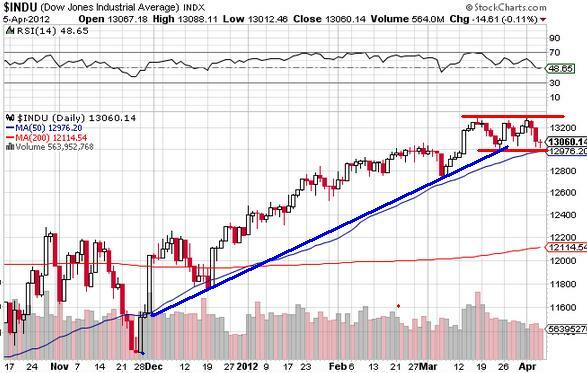 Of greater interest is the 14,093 peak from October, 2007. If we can get above that number, it would be very hard to argue that we are not in a bull market. I’m conflicted on this one. I assume that a week economy, with high unemployment and massive government spending is not good. I assume that will eventually lead to lower markets. However, it is an election year, and what better way to prove that the economy is fine than to engineer a new high on the stock market? Print money, invest it in the market, and make the market go up. Then you can stand up and say “re-elect me, everything is great!” That scenario would not surprise me in the least. Of greater interest to me is the future for gold. 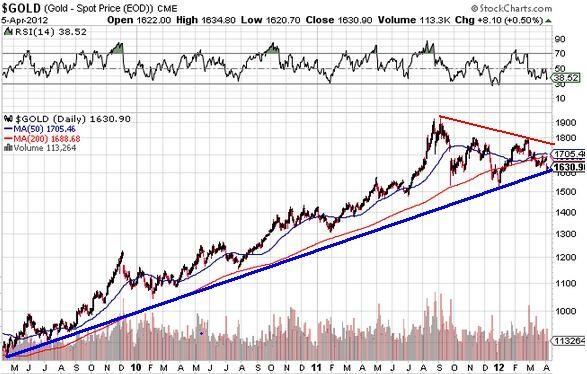 As the blue up trend line shows, the bull market for gold is still going. I could draw the chart back ten years, and the chart would look the same. Of course since the peak last summer at $1,900, we gold bugs have watched the precious metal decline substantially, and a decline back to the $1,500 level would not look good technically. But again, would it really mean anything? 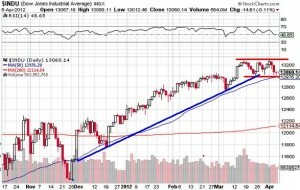 If the Big Boyz decide to drop the price below the support line, does it mean the bull market is ending? Nope, it’s just a way to get the weak hands out of the market. If I had more guts I’d be buying now. But I don’t. I’m still nervous and expecting a further correction, so I’ll sit on the sidelines, and then look back in a year and wish I had taken advantage of this opportunity. We shall see. Thanks for reading, and see you next week.